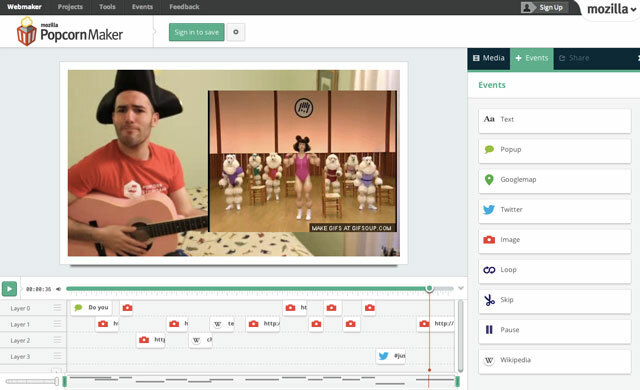 As explored in part one, Popcorn.js and timed metadata are ways to bring the rich interactive and interconnected web into video and audio. As audiences increasingly 'dual-screen' – surf the web and social networks while watching TV or a video in the background – connecting this extra information to a film in a way that is coherent with the look and feel of the film, has lots of potential. Inspired by the pop-up info panels that would appear on some music TV shows, pop-ups let you provide text-based commentary during a video and can be styled and coloured as needed – and placed anywhere on screen for as long as desired. Because these aren't encoded into the video, they can be indexed by search engines, translated by screen readers – and changed and added to during the life of the video. By making title cards and on-screen captions HTML rather than rendered in-video, they can be made interactive by linking to a website, streaming recent tweets, being translatable through on-screen translation tools and indexable by search-engines. 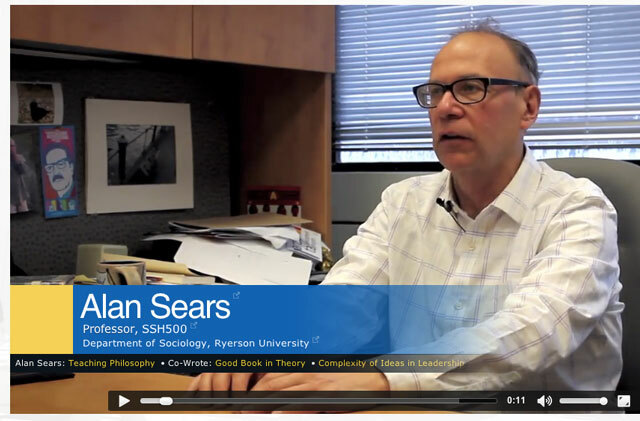 In this example for Ryerson University, although they are styled to look like they are part of the video, the slugs for each interview are HTML and feature a set of links – to the person’s website, their university department, their books and so forth. This method also lets you update mistakes after the film – or change the job title, surname, or references as the film ages. There has been much discussion in the documentary community about crowd-driven stories which pull in video from the audience - with films such as Glastonbury, Life in a Day, 10.10.10 and the forthcoming We Are Northern Lights all built from user-submitted footage. 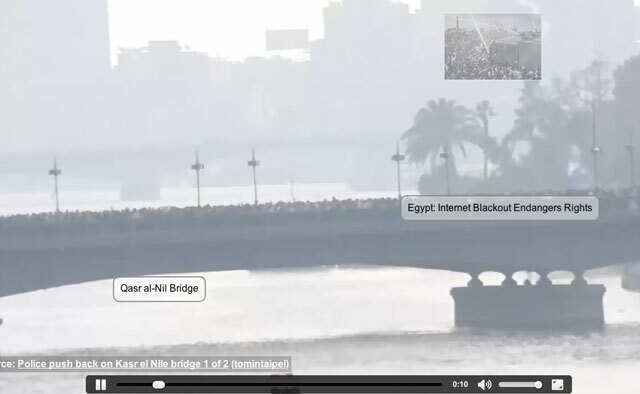 18 Days in Egypt is an attempt to pool the vast quantity of user-generated media around the uprising in Egypt into a single crowd-built documentary. The filmmakers worked with developer Brian Chirls (@bchirls) experimented with Popcorn in two ways: firstly to add multiple videos of a single event into one space, alongside annotations and further information coming from Twitter at that time. By pulling in recent data or graphics from the wider web, a Popcorn ‘video’ can render a different viewer experience every time it is watched. This can be particularly powerful with audio where there is no music video or related information. 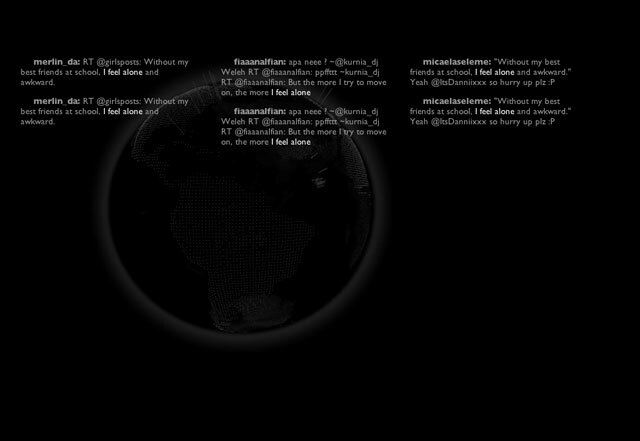 In this example, the music video for Know Your Exit is generated through a number of tweets it can find that use lyrics from the song - which works well for a song about the sense of isolation in the modern world. Also exploring how Popcorn can make audio more visual, the Hyperaudio project teamed up with Radiolab to produce an experiment in web based radio. 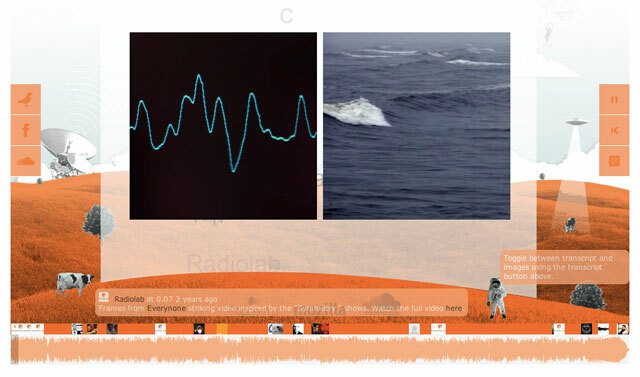 The player allows listeners to upload photos (via Flickr) and comments (via Soundcloud) and mashes them in a unique and appealing manner. If you click the transcript button to the right you can see the full transcript of the radio programme and clicking on a word to jump to that part of the audio. Archived videos of lectures, classes, conference speeches and interviews can be enhanced by connecting and syncing slide presentations with the video itself, and comments or links to resources. The idea has been around for a while, Popcorn is one of the first non-Flash based solutions to do this. 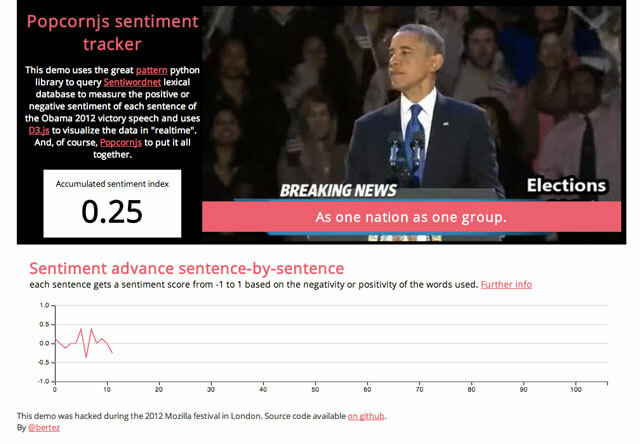 Buiilt around the Sentiwordnet language analysis framework, the demo below analyses the content of a speech by newly re-elected President Obama, and plots the negative and positive words on a graph. The applications for this could be interesting when applied to the live tweets accompanying a TV broadcast as it would demonstrate real-time audience feedback – interesting for both analysis and metrics. For filmmakers who don’t want extra data to interfere with the audience’s experience of watching their film – Swedish filmmaker Simon Klose worked with Popcorn hackers at the Mozilla Festival 2011 to create an elegant hidden sidebar where references can appear. After joining Mozilla's WebFwd programme, the director of the anticipated Pirate Bay documentary developed the system into a start-up, LinkLib, launched at this year's MozFest. This provides extra information about everything on screen (who is speaking, Wiki references, and so forth) in a ‘waterfall’ of data that can be hidden or shown to side of the video, not interfering with playback. If you look at the demo below you can see how the right column can be shown or hidden. 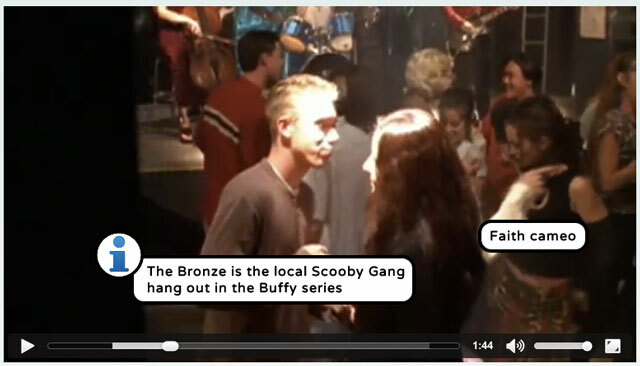 In a previous version, when the mouse rolls over an annotation, it paused the video while clicking on any of the references would jump the video to that point, making it a method to navigate around the video. LinkLib also lets you, by scanning the QR code, get the extra data through the browser of your smart phone or tablet, letting you have a data-free 'big screen' experience. Online meme-sharing seems to happen most quickly when a meme can be easily adapted and remixed – be it photos of cats with ever funnier captions or Downfall's Hitler in fury at the latest controversy. For digital natives growing up in a wired world, remixability will probably be assumed with anything they intend to share – from trailers and posters to campaign and activist videos, and features. Of course, it will better suit some projects than others. In the following Popcorn video (produced at MozFest 2012), the video gains more meaning when you make it your own, and share it amongst friends. There's more on memes and Popcorn here. Video and audio can pull in live map references from Google and Open Map, and even street-view level tours. 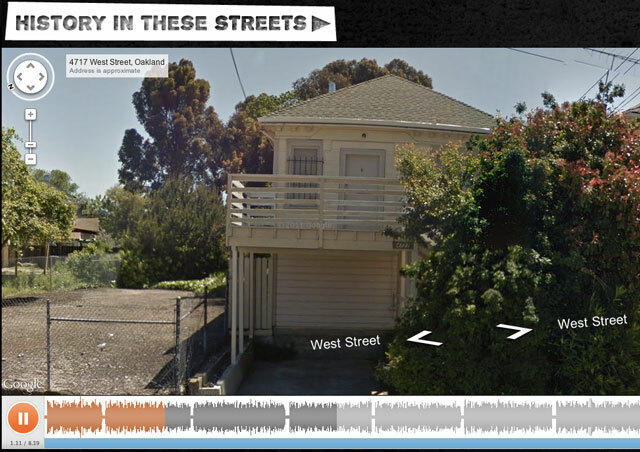 In this example, created by young members of the Bay Area Video Coalition, David Hilliard, former chief of staff for the Black Panthers, gives an audio tour of key parts of Oakland, accompanied with views of the street and annotations. By using Soundcloud, people can comment on the film throughout. 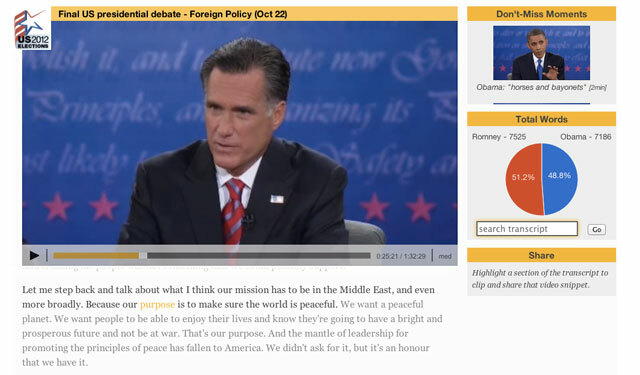 By adding extended metadata to parts of a video – map references, wiki references, transcriptions and so on – the process of cataloguing and finding relevant video is made much easier, as researchers can find specific parts of videos of relevance and connect lots of related resources to a specific timecode. 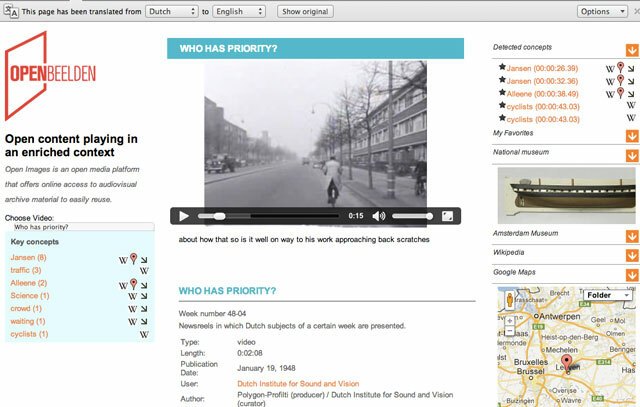 Some tools, like this prototype from Open Images illustrate how much extra info can be added to video – while also illustrating how much more useful it is to have this data outside of the video and not using Flash, because although it is written in Dutch, it is possible to re-render the whole page into another language with Google Translate. That does sound like an interesting one – looking forward to that link. Can see that work well with community screenings & NGO partnerships too. And it’ll probably be my browser, I’ll try again with Chrome! Thanks for the feedback Ellen. Both the 18 days links are working ok for me – but some of the demos won’t work great or at all if you’re not using the latest Firefox or Chrome. With remixable stories there was a great demo I saw at the Mozilla festival that isn’t online yet, but hopefully will be son. It was a global campaigning video that allowed local organisations to modify it for their own needs / language, and embed different links. It could be nice if you wanted, say, to release a trailer with different language versions or which people could modify themselves a bit before sharing. Some of these samples are great, can see ourselves exploring no. 2,3 & 9 on upcoming projects. 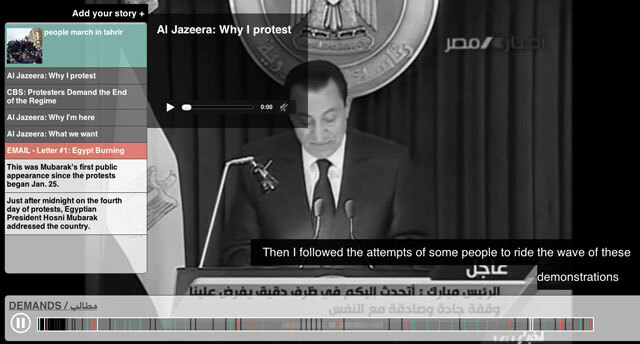 Was keen to see Mubarak’s sample at no. 4 but link doesn’t work? Some of the others I found quite confusing, jumpy & lack quality content, like no.10 and hope there will be a time & place for this more intrusive way of viewing. But I love the potential of a different user experience and exploring hyper media to enhance the story! Thanks for the post.